Even though it's not always easy to have everything I need in the fridge at all times, one of the things I keep a constant stock of is mushrooms. My husband loves mushrooms, and I love that it is easy to find a wide variety of mushrooms at Asian markets (if you have never shopped at an Asian grocery market, I highly recommend it for cheaper, fresher produce!). I came across this mushroom dish looking at some photos of breakfast dishes that can be eaten for dinner, and I knew I had to adapt it to make it my own. It was simple to make, used ingrdients that I already had in the fridge, and it looked absolutely delicious! I ended up not using the jalapeno and instead used red chili peppers for an extra kick, but you could incorporate jalapeno in the dish if you like some spice. First, start cooking the farro according to directions. You can eat this dish with bread (as was the original recipe), but I wanted something a little heartier. I think couscous or quinoa would work as well. I found this 10 minute farro at Trader Joe's, and all you have to do is cook in boiling water for 10-12 minutes. Sounds simple enough for me! While farro is cooking, start prepping the mushrooms. Clean and chop mushrooms into edible size. 16 ounces can seem like a lot, but it actually shrinks up quite a bit when you cook it, so I found 16 ounces to be about right for 2 people. Heat 1 tablespoon of extra virgin olive oil and 1 tablespoon of butter in a large pan. I used this garlic butter I found at Costco, and I've been using this everywhere! I love garlic, so this has been my go-to butter as of late, but if you don't have it, regular butter is fine. You can even just use 2 tablespoon of evoo, but I like a little buttery flavor with my mushrooms, so I used 1 tablespoon of butter as well. Add mushrooms and sautee. Add a pinch of salt and pepper. Cook for about 5-6 minutes, until mushrooms have shrunk and it looks juicy. Add the champagne vinegar and cook for another minute until the vinegar cooks off. Turn off heat and add the herbs, mix well. Once farro is done and the mushrooms are cooked, assemble the dish. Sprinkle parmesan cheese, salt and pepper to taste, some red chili pepper flakes for a kick, and extra green onion. Eating it with farro makes this hearty enough for dinner, but depending on how you make it, this dish would be delicious as breakfast, lunch, or light dinner. 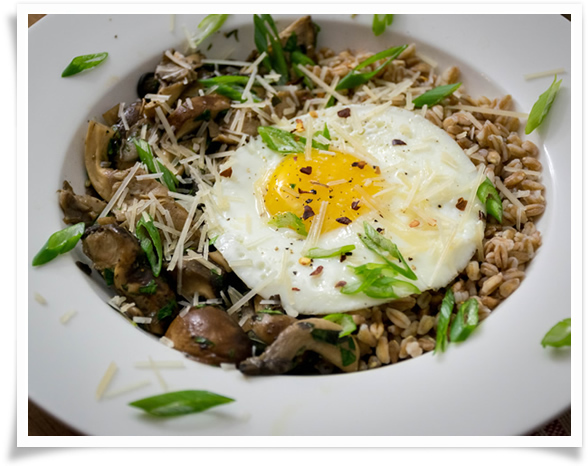 If you're a mushroom lover like my husband, you will love this dish. Enjoy!